He is known for his signature “drip painting.” That’s when he pours paint onto a canvas. It’s a piece for everybody walking by…. somebody commissioned it and owns it but it more belongs to everybody here in Brickell and everyone that passes by,” said Linnenbrink. Anyone who passes by the new SLS high-rise will see his installation enveloping the entire facade. Crews are prepping the rest of the building, painting it white. It’s a massive blank canvas for him to paint on. When complete, the mural will measure over 40,000 square feet. The end product will be a huge wall packed with color. Basically, we are producing a giant watercolor,” said Linnenbrink. But how does he do it? A YouTube video of Markus creating a similar installation at the Pennsylvania Academy of fine arts building shows it’s a tedious and time-consuming process with the help of physics. This is done completely without brushes so we are just using water, the way water runs and gravity,” said Linnenbrink. 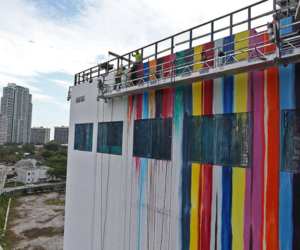 The installation was commissioned by Jorge Perez, of the Perez Art Museum, as part of his commitment to providing museum – quality art for all Miami residents. Brickell with all its concrete and cement is the perfect spot for some vibrancy. We really wanted to not lose that aspect of what Miami is really like which is color and light and landscape and we thought it was appropriate for the neighborhood,” said Perez. Linnenbrink is expected to finish next week. The stunning mural is hard to miss but if you want to check it out, it’s on 1300 South Miami Avenue.